Carmageddon was once a groundbreaking game. It was populair. It got the news. It was one of the best games I ever played. And played, and played. It was a Mac OS game. There was a second, even better version. I even bought a 3DFX card because of Carmageddon II. Then, we lost contact: It didn’t play on OS X and the third version was PC only. On June 7, 2012 there a successful Kickstarter.com fundraiser was held. The guys from the old studio had bought the Carmageddon rights from the publisher and a new version would be made! Even a Mac and Linux version were funded as the stretch goals were met. $ 625.000 were collected. For 22 months, Nobby from Stainless Games kept us updated about the game, teasing me about Carmageddon Reincarnation. On march 13, a ‘pre alpha version’ was released for Kickstarter backers. However, this is a Steam PC version only. The requirements are: Windows 7 or 8. This was a bit of a downer, since I really wanted to play it by now! My first idea was to use Parallels 9 to install Windows 8.1 on Mac OS X Mavericks on a MacBook Pro 2013, because these are all the latest versions. Then run Carmageddon: Reincarnation on Steam, on Windows 8.1, on Parallels 9, on OS X Mavericks. However this didn’t work, even after assigning more memory to Parallels. Then I thought of CrossOver. It makes use of WINE, to create ‘bottles’.. The short version is, that it depends per application, whether it works. There are ‘recipes’ for certain applications, for Steam on Windows XP for example. There was no recipe for Steam on Windows 7 or 8 however, and from experience, I know what this omission means: It’s not going to work. This leaves only the real deal: Installing Windows with Boot Camp on my Mac. Long story short: it took me half a day. Finally, I had it running: the pre-alpha version of Carmageddon Reincarnation on Steam, on Windows 8.1, on a MacBook Pro late 2013 . And pre-alpha it is… At about 3 or 4 frames per second, there is no steering to it whatsoever. Completely un-playable. That was March 2014. 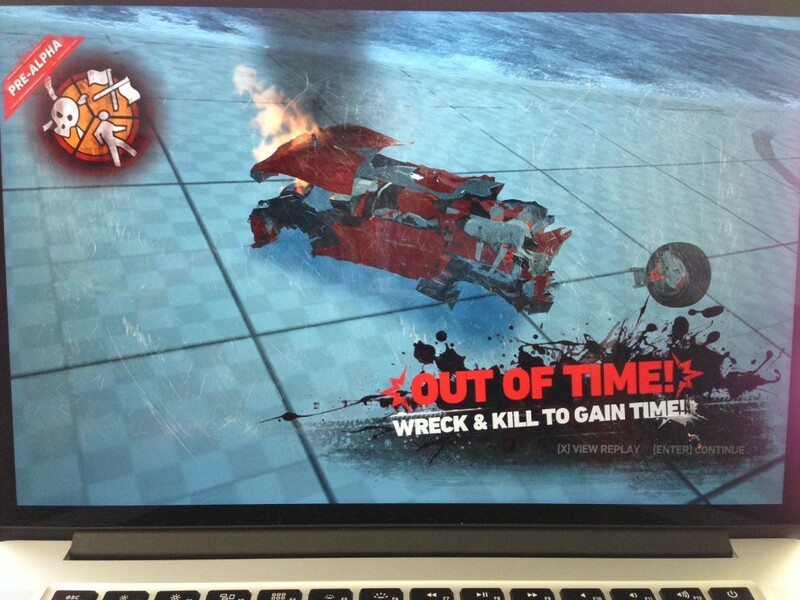 Years went by without even a word from Stainless about a Mac version of Carmageddon: Reincarnation. Some Windows users kept defending Stainless for years, saying we’d have to be patient. The Windows version needed to be ‘final’ first, before a Mac and Linux version would be made, how could I not see that? Since the final release for Windows in May 2015 and on disc for Windows in 2016 however, still not a word about the Mac version. I mailed Kickstarter if this was all honky dory by their standards and they basically said I should ask Stainless. Carmageddon: Max Damage, basically an updated version of Carmageddon: Reincarnation, has meanwhile come out for Xbox One and PlayStation 4, in the summer of 2016. Those platforms didn’t even exist when Stainless accepted my money for the Mac Version. The announcement of the platform versions confirmed what was clear to me already. Stainless was not even going to try to make a Mac version. Meanwhile it’s December 2017 and 5,5 years since the Carmageddon Reincarnation started. You might want to keep this in mind when considering backing another Kickstarter project. It may never be build, even if it’s more that fully funded.